Professor Holm-Hadulla has written several books on creativity, psychotherapy and the eminent politician, scientist and poet Goethe. Individual papers offer interdisciplinary perspectives of creativity research, e.g. "The Dialectic of Creativity" (2013). 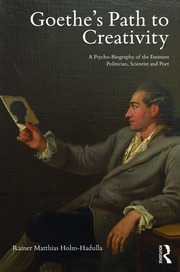 Psycho-biographical studies focus not only on Goethe but on artists like Robert Schumann (2017) and Jim Morrison (2014). Professor Holm-Hadulla studied medicine and philosophy at the Universities of Marburg, Rome and Heidelberg. From 1976 till 1978 he worked as a medical doctor. During the period from 1979 till 1986 he became a specialist in psychiatry, psychosomatic medicine and psychotherapy and assistant professor at the Center for Psychosocial Medicine, Heidelberg University. From 1986 till 2016 he was the director of the Psychosocial Counseling Service for Students at Heidelberg University. During this time he was appointed as a fellow to Centers of Advanced Studies at Cologne University and Heidelberg University. As a visiting professor he taught in China and frequently in Chile and Argentina. He works now as a professor at Heidelberg University and a training psychoanalyst and director of the Heidelberg Institute for Coaching. Music from Mozart and Verdi to The Doors and The Rolling Stones. Singing, guitar playing, walking, thinking freely and being with loving people.